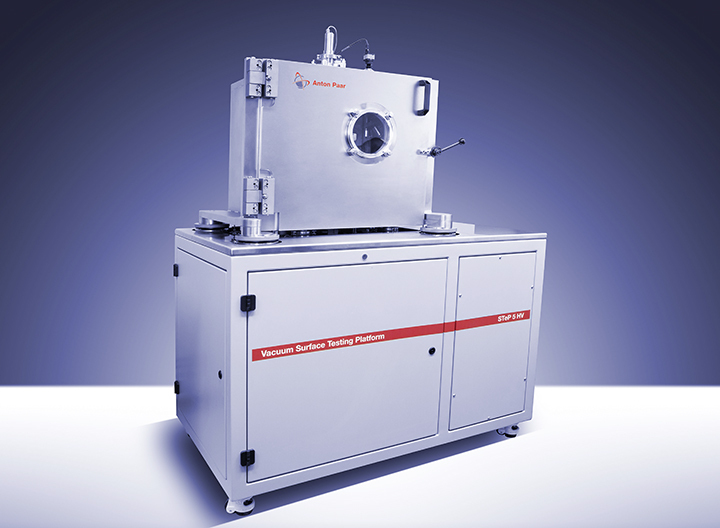 The UNHT³ HTV high-temperature nanoindentation tester is a low-load nanomechanical test system for measuring the hardness and elastic modulus of thin films and coatings up to 800 °C. Patented UNHT technology combined with unique heating provides a high stability solution at any temperature. The lowest thermal drift at ambient conditions (< 0.5 nm/min) and over the entire temperature range (< 3 nm/min). The highest load frame stiffness (>>106 N/m) and lowest frame compliance (<<0.1 nm/mN): Two independent depth and load sensors combined with high-resolution capacitive sensors for true depth and load control modes. High vacuum system with 5-axis magnetically levitated turbopump and buffer system which allows switching off the primary pump during measurement so that pump vibration is minimized. Unique heating management (3 patents pending) which incorporates 3 infrared (IR) heaters for the indenter, reference and sample and 4 thermocouples for controlling sample surface temperature to within 0.1°C.